Medicago is a genus of flowering plants, commonly known as medick or burclover, in the legume (Fabaceae) family. It contains at least 87 species and is distributed mainly around the Mediterranean basin. The best-known member of the genus is alfalfa (M. sativa), an important forage crop, and the genus name is based on the Latin name for that plant, medica, from Greek: μηδική (πόα) Median (grass). Most members of the genus are low, creeping herbs, resembling clover, but with burs (hence the common name). 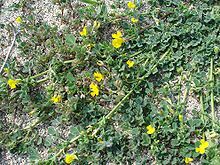 However, alfalfa grows to a height of 1 meter, and tree medick (M. arborea) is a shrub. Members of the genus are known to produce bioactive compounds such as medicarpin (a flavonoid) and medicagenic acid (a triterpenoid saponin). Chromosome numbers in Medicago range from 2n = 14 to 48. The species Medicago truncatula is a model legume due to its relatively small stature, small genome (450–500 Mbp), short generation time (about 3 months), and ability to reproduce both by outcrossing and selfing. Comprehensive descriptions of the genus are Lesinš and Lesinš 1979 and Small and Jomphe 1989. Major collections are SARDI (Australia), USDA-GRIN (United States), ICARDA (Syria), and INRA (France). Medicago diverged from Glycine (soybean) about 53–55 million years ago (in the early Eocene), from Lotus (deervetch) 49–51 million years ago (also in the Eocene), and from Trigonella 10–22 million years ago (in the Miocene). Béna et al. (2005) constructed a molecular phylogeny of 23 Sinorhizobium strains and tested the symbiotic ability of six strains with 35 Medicago species. Comparison of these phylogenies indicates many transitions in the compatibility of the association over evolutionary time. Furthermore, they propose that the geographical distribution of strains limits the distribution of particular Medicago species. 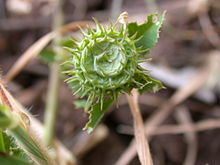 Other than alfalfa, several of the creeping members of the family (such as Medicago lupulina and Medicago truncatula) have been used as forage crops. Wikimedia Commons has media related to Medicago. Medicago species are used as food plants by the larvae of some Lepidoptera species including the common swift, flame, latticed heath, lime-speck pug, nutmeg, setaceous Hebrew character, and turnip moths and case-bearers of the genus Coleophora, including C. frischella (recorded on M. sativa) and C. fuscociliella (feeds exclusively on Medicago spp.). Medicago astroites (Fisch. & Mey.) Trautv. Medicago monantha (C. A. Meyer) Trautv. Medicago orthoceras (Kar. & Kir.) Trautv. Medicago suffruticosa Ramond ex DC. Medicago lanigera Winkl. & Fedtsch. Medicago littoralis Rohde ex Lois. Recent molecular phylogenic analyses of Medicago indicate that the sections and subsections defined by Small & Jomphe, as outlined above, are generally polyphyletic. However, with minor revisions sections and subsections could be rendered monophyletic. ^ Some sources treat Medicago citrina as a synonym of Medicago arborea. ^ The validity of Medicago sinskiae has been questioned by Small and Jomphe, 1988. ^ "Genus Nomenclature in GRIN". Retrieved 9 September 2010. ^ a b Steele KP, Ickert-Bond SM, Zarre S, Wojciechowski MF (2010). "Phylogeny and character evolution in Medicago (Leguminosae): Evidence from analyses of plastid trnK/matK and nuclear GA3ox1 sequences". Am J Bot. 97 (7): 1142–1155. doi:10.3732/ajb.1000009. PMID 21616866. ^ a b Gholami A, De Geyter N, Pollier J, Goormachtig S, Goossens A (2014). "Natural product biosynthesis in Medicago species". Natural Product Reports. 31 (3): 356–380. doi:10.1039/C3NP70104B. PMID 24481477. ^ "Alfalfa Crop Germplasm Committee Report, 2000". Archived from the original on 2009-05-05. Retrieved 2009-11-04. ^ New Oxford American Dictionary (2nd ed., 2005), p. 1054, s.v. medick. ^ Rosato M, Galián JA, Rosselló JA (2012). "Amplification, contraction and genomic spread of a satellite DNA family (E180) in Medicago (Fabaceae) and allied genera". Ann Bot. 109 (4): 773–82. doi:10.1093/aob/mcr309. PMC 3286279. PMID 22186276. ^ "Medicago truncatula". Retrieved 21 November 2008. ^ Lesinš KA, Lesinš I (1979). Genus Medicago (Leguminosae): A Taxogenetic Study. The Hague, The Netherlands: Dr. W. Junk B. V. Publishers. p. 132. ISBN 978-90-6193-598-8. ^ a b c d Small E, Jomphe M (1989). "A Synopsis of the Genus Medicago (Leguminosae)". Can J Bot. 67 (11): 3260–94. doi:10.1139/b89-405. ^ "SARDI". Retrieved 21 November 2008. ^ "GRIN National Genetic Resources Program". Retrieved 21 November 2008. ^ "ICARDA Sustainable Agriculture for the Dry Areas". Retrieved 21 November 2008. ^ "INRA". Retrieved 21 November 2008. ^ a b Cannon S. (2008). "3. Legume Comparative Genomics" (PDF). In Stacey G (ed.). Genetics and Genomics of Soybean. Plant Genetics and Genomics: Crops and Models. II. New York, NY: Springer. p. 38. ISBN 978-0-387-72298-6. ^ a b c Maureira Butler IJ, Pfeil BE, Muangprom A, Osborn TC, Doyle JJ (2008). "The reticulate history of Medicago (Fabaceae)". Syst Biol. 57 (6): 466–482. doi:10.1080/10635150802172168. PMID 18570039. ^ a b Béna G, Lyet A, Huguet T, Olivier I (2005). "Medicago–Sinorhizobium symbiotic specificity evolution and the geographic expansion of Medicago". J. Evol. Biol. 18 (6): 1547–58. doi:10.1111/j.1420-9101.2005.00952.x. PMID 16313467. ^ Lawson (2001). "Suitability of Medicago clover species as a forage crop: a study of controlled dietary intake on livestock health over time". International Journal of Agricultural Research. 9 (3): 33–44. ^ "ILDIS LegumeWeb". Archived from the original on 1999-10-07. Retrieved 2008-11-18. ^ "Genera Containing Currently Accepted Names: Medicago". Archived from the original on September 30, 2008. Retrieved 2008-11-18. ^ "Species Nomenclature in GRIN". Archived from the original on 1999-05-01. Retrieved 2008-11-18. ^ "IPNI Plant Name Query Results". Retrieved 2008-11-22. ^ "AgroAtlas - Relatives". Retrieved 2008-11-22. ^ "Discover Life". Retrieved 2010-05-11. ^ Gillespie DJ, McComb JA (1991). "Morphology and distribution of species in the Medicago murex complex". Can J Bot. 69 (12): 2655–2662. doi:10.1139/b91-333. ^ a b Béna G, Lejeune B, Prosperi JM, Olivieri I (1998). "Molecular phylogenetic approach for studying life-history evolution: the ambiguous example of the genus Medicago L." Proc Biol Sci. 265 (1401): 1141–1151. doi:10.1098/rspb.1998.0410. PMC 1689169. PMID 9684377. ^ a b Downie SR, Katz-Downie DS, Rogers EJ, Zujewski HL, Small E (1998). "Multiple independent losses of the plastid rpoC1 intron in Medicago (Fabaceae) as inferred from phylogenetic analyses of nuclear ribosomal DNA internal transcribed spacer sequences". Can J Bot. 76 (5): 791–803. doi:10.1139/b98-047. ^ a b Béna G, Prosperi JM, Lejeune B, Olivieri I (1998). "Evolution of annual species of the genus Medicago: a molecular phylogenetic approach". Mol Phylogenet Evol. 9 (3): 552–559. doi:10.1006/mpev.1998.0493. ^ a b Béna G. (2001). "Molecular phylogeny supports the morphologically based taxonomic transfer of the "medicagoid" Trigonella species to the genus Medicago L.". Plant Syst Evol. 229 (3–4): 217–236. doi:10.1007/s006060170012. ^ a b Yoder JB, Briskine R, Mudge J, Farmer A, Paape T, Steele K, Weiblen GD, Bharti AK, Zhou P, May GD, Young ND, Tiffin P (2013). "Phylogenetic signal variation in the genomes of Medicago (Fabaceae)". Syst Biol. 62 (3): 424–38. doi:10.1093/sysbio/syt009.